When it comes to eating fruit, my children are very picky about what they like, a lot of fruits have a unique texture & my children won't eat them because of that. 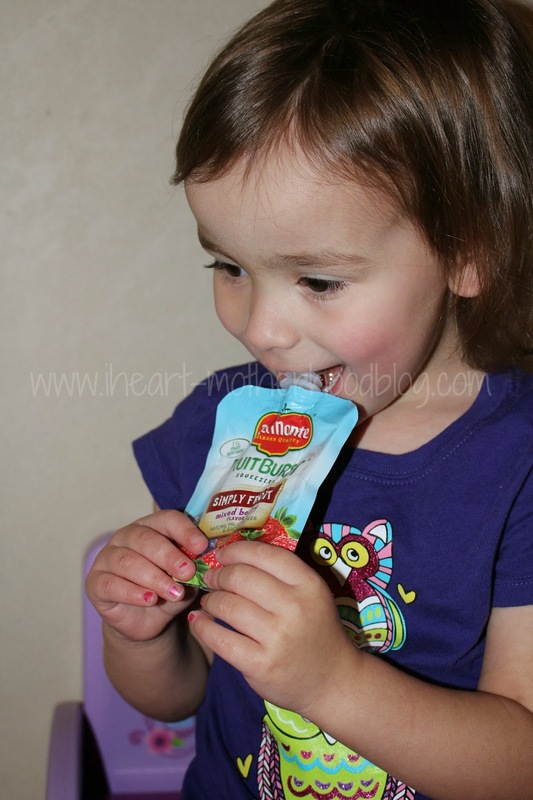 So when I heard about Del Monte's Fruit Cup Snacks & Fruit Burst Squeezers, I knew I wanted my children to try these out & I crossed my fingers with hopes of them gobbling up our new Del Monte snacks! The Del Monte Mango Pineapple Fruit Cup Snacks are the newest variety to the 4-pack Fruit Cup collection & they are the perfect healthy snack, containing no high fructose corn syrup while rich in vitamin C & made with all natural Mangos & Pineapples. Del Monte Fruit Burst Squeezers are made in the U.S.A & contain no artificial flavors or high fructose corn syrup but instead have 1 ½ servings of fruit or fruit & veggies & are an excellent source of vitamins A as well as C. These are the perfect on-the-go snack & are available in two varieties; Simply Fruit (Strawberry, Mixed Berry & Apple Cinnamon) as well as Fruit + Veggie (Peach-Mango & Blueberry). My daughter went straight for the Del Monte Fruit Burst Squeezers while my son was excited to try the Mango Pineapple & Diced Mangos fruit cup snacks! Thanks to Del Monte my children are enjoying healthy fruit options & these will make a great addition to my son's lunch box for school or an afternoon snack for my daughter! Which Del Monte product are you most excited to try!? Buy it: Purchase a variety of Del Monte products at your local Walmart! 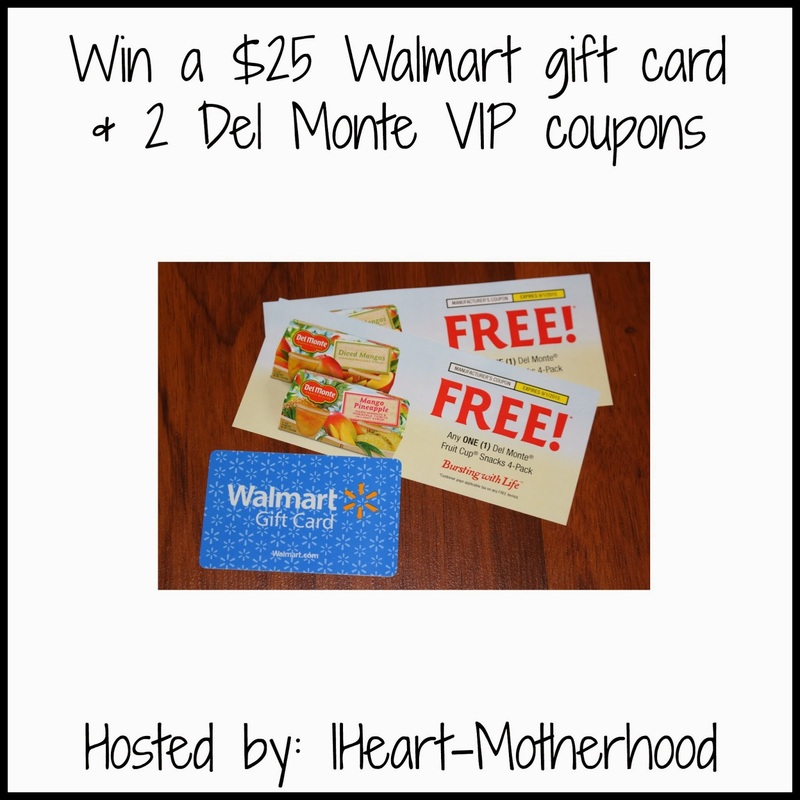 Win it: One lucky reader will win a $25 Walmart gift card & 2 Del Monte VIP coupons to purchase & try Del Monte products! I'd like to try the Del Monte® SuperFruit® Peach Chunks in Pomegranate & Orange Juice Blend. superscript pear chunks in acai juice yum! I would like to try the SuperFruit Pear Chunks in Acai & Blackberry Juice Blend. 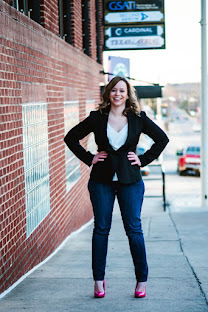 Well, I can't state which I'd try, because I've tried all that I can between local availability and food allergies! I LOVE Del Monte, especially their new line of fruit cups in 100% juice, no syrup! I wanna try the veggie squeezers! everyone can stand to get more veggies! the fruit burst pouches look interesting, i'd like to try that. I'd love to try the Fruit Naturals Citrus Salad. I also like their Del Monte Chili Sauce. It's great for cooking! Del Monte Fruit Chillers® Strawberry Snow Storm Tubes look amazing too! The veggie squeezers look good too! Their jarred peaches would be wonderful in a fruit salad too! Thank you! I would love to try the Fruit Burst Squeezers in Mango! I would like to try the Del Monte® SunFresh® Mango. I would like to try the citrus salad. I like the Del Monte® Italian Recipe Stewed Tomatoes. id love to try the Mango Pineapple cups! I want to try the Cherry Mixed Fruit.